These are all good quality and versatile blenders that can make delicious smoothies without hurting your wallet too much. While I also have a good juicer in my kitchen that I use quite often, I still prefer to blend my greens, simply because it gives me more value for money. A juicer extracts juice from fruits and vegetables and leaves pulp behind. A blender on the other hand leaves no pulp behind and basically gives you a complete meal. The pulp includes the skin of fruits and vegetables which is often a great source of fiber and other essential nutrients. Blending is one of the easiest and quickest ways to get a great variety of nutrients in. Literally within 5 minutes and with very little effort you can prepare yourself a nutritious green smoothie with a great variety of nutrients. If you want to be serious about blending, I would recommend to stay away from blenders under $100, such as various budget Ninja or Nutribullet models. They work fine for a while but their shortcomings (not much power, not very durable, poor smoothie quality, etc.) will eventually lead to frustration and disappointment. As with anything, you get what you pay for. At the other end of the spectrum, Vitamix and Blendtec blenders are top quality machines but they are expensive. If you’re looking for an affordable blender that performs well and will last several years, it’s best to look for a blender that sits between a cheap blender under $100 and an expensive Vitamix blender. The below list of best affordable blenders however, does include the Vitamix 5200. It’s my all-time favorite blender and it’s also one of the more affordable ones in the Vitamix range. I just had to include it as no other blender has ever outperformed it in my opinion. Here are my 9 recommendations for good quality, affordable blenders that can create delicious smoothies for you without any hassle. Introduced in 2016, the BlendWorks All-In-One Blender is the new kid on the block in the world of blenders. Designed with value and convenience in mind, the purpose this blender set is to improve and simplify the home blending process. Similar to the Ninja Mega Kitchen System, BlendWorks not only lets you create delicious smoothies without hassle, it can also easily prepare soups, dips and sauces. You can do all this with the very same BPA-free 70oz/2L jar, hence the name “all-in-one”. The decent 2.0 peak-horsepower motor provides 1500 watts performance at 30,000 RPM, more than good enough to create well-blended, creamy green smoothies. 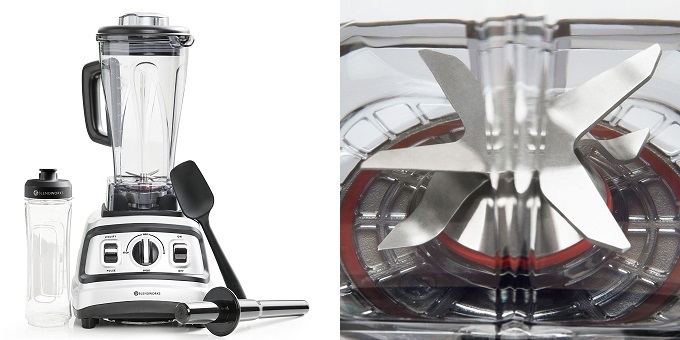 The key difference between this model and for example the Vitamx and Blendtec models is that the BlendWorks has 6-way stainless steel blades, designed to better pulverize the goodies you put into the jar. The 6 blades look a but weird, almost like it’s a bit of an overkill, but according to its reviews this machine does a fine job at blending. It may also be a bit harder to clean the blades I would imagine. What’s included in this blender set? It comes with a decent-sized 70oz plastic jug with measurement lines, a 20oz travel cup on-the-go, a tamper to assist with bulky ingredients and a handy silicone spatula to better empty the jug after blending. 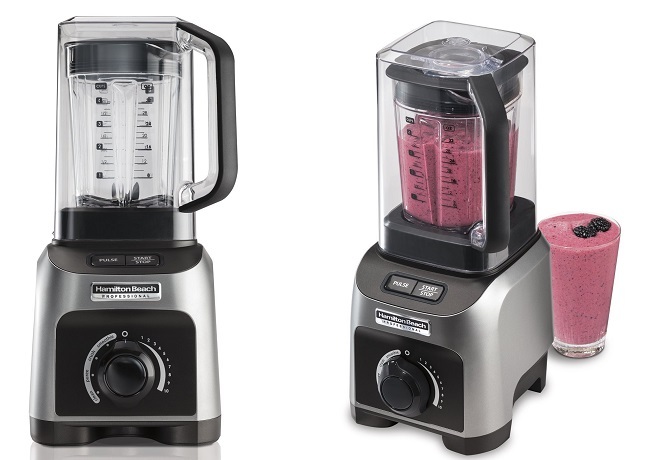 It’s a decent blender set at an affordable price, but I would still prefer a (refurbished) Vitamix or Blendtec product. The fact that new models often look very much like the classic Vitamix blender models says a lot about the popularity and quality of Vitamix. I purchased a Vitamix 5200 (Total Nutrition Center) about 5 years ago and it’s still working as well as it did on its first run. It simply won’t break. It can also prepare delicious soups because the blades can reach speeds that are fast enough to create heat, so you can have a nice warm bowl of soup literally within minutes. The generous size of the classic 64-ounce container is perfect for blending medium to large batches. Cleaning the container is incredibly easy too. The 5200 is part of the Classic C-Series and is an excellent model to get started with blending. The Vitamix 5300 is almost exactly the same as the 5200 but it has a wider and lower jar which some may find more practical, especially for storing purposes. 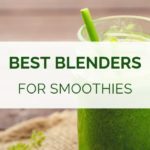 While not the cheapest blender, I really wanted to include the popular Vitamix 5200 in this list of best blenders for green smoothies as it’s such a great machine. What I like most about the 5200 is its old-school, straight-forward design without unnecessary digital bells and whistles. It’s actually one of the more affordable blenders in the Vitamix range so if you have a bit of budget available, I would strongly recommend looking into this model. 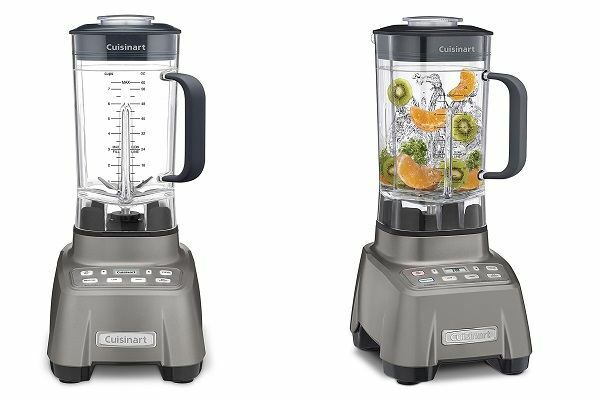 The popular and affordable Cuisinart Hurricane is the perfect blender for those that are not ready to invest in a high-end Vitamix or Blendtec but also don’t want to be disappointed with a cheap blender under $100. 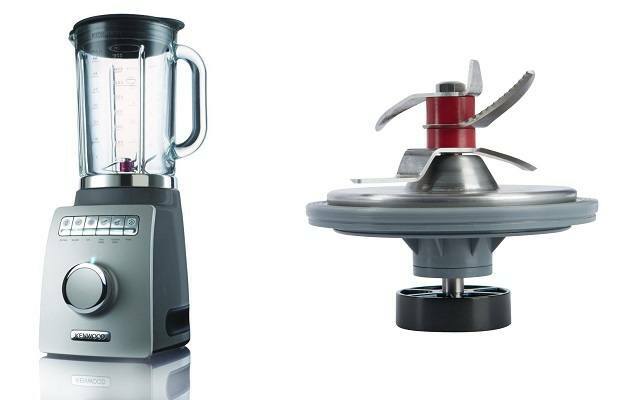 The biggest draw card of this blender is the not-too-noisy yet powerful 2.25 peak HP motor that can pulverize all types of fruits and vegetables with ease. One of the things I always look for in a blender is a large jar. A smaller sized container may sound compact and convenient but blending larger batches of green goodness in one go is just so useful. The Cuisinart Hurricane comes with a 60-ounce BPA-free container, designed for easy pouring. It also has a soft-touch handle for a secure and comfortable grip. The Hurricane has settings for high and low power blending as well as a pulse setting to quickly chop heavy ingredients in smaller chunks. In addition, this model has 2 pre-programmed cycles for smoothie and ice crush. While Ninja certainly isn’t my go-to brand for blenders, their higher end models are actually very decent and versatile. As long as you avoid the cheaper blenders under $100, you will have a lot of fun with a Ninja blender. The biggest feature in the Nutri Ninja Duo is the Auto-iQ technology that give you intelligent blending programs that take the guesswork out of blending. It combines timed blending, pulsing and pausing functions without you having to look after it. And the digital countdown timer tells you exactly when your green smoothie is ready. As with most Ninja models, the Nutri Ninja Duo comes with a whole set of (BPA-free) jars and cups. In addition to the main container with a 64 oz capacity, you will also find three smaller but very useful Ninja cups in the box. They are great for smaller batches on the go. The 75 recipe cookbook is a great bonus gift that will give you lots of inspiration to get serious about blending. You will notice the striking resemblance with any Vitamix blender straight away, especially with the tamper that comes with it and the three buttons at the front. But that’s probably exactly what the Cleanblend is meant to be, a more affordable version of a Vitamix blender. Whether it’s the same value for money, I’m not sure, but the reviews for this model say that it’s a pretty reliable machine. Just like the Vitamix 5200, the Cleanblend has a variable speed control button (which I find super useful) and has an easy self-cleaning procedure. My take on this machine is that it’s a great substitute for the Vitamix 5200 but perhaps not with the same longevity. There are no certified refurbished versions available for this model. This list of best blenders for green smoothies wouldn’t be complete without a Blendtec machine. Blendtec’s base model, the Classic 575, is excellent value for money. Similar to the Vitamix 5200, the 575 is the perfect blender for those just starting out with blending. 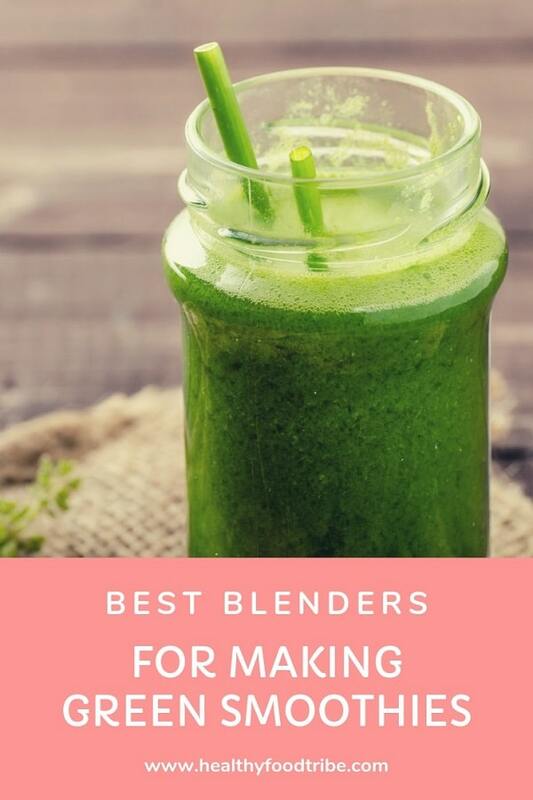 It may not be the cheapest model in this list of best blender for green smoothies, but the 575 is one of the most affordable models in the Blendtec range. The 575 is well equipped with 5 different speed settings and a pulse feature that works the same as with the more expensive Vitamix 750. The pre-programmed cycles for smoothies, cleaning and 60- and 90-second blends are also very useful. The FourSide jar can contain up to 64 ounces of liquid. Ninja has a lot of cheap blender models on the market that are actually quite popular. I had one too at some point and was reasonably happy with it. But as much as I dislike overspending on kitchen equipment, a cheaper blender model simply doesn’t meet my standards. The quality of the smoothies I get out of my Vitamix is just not comparable to what a cheap blender can deliver. 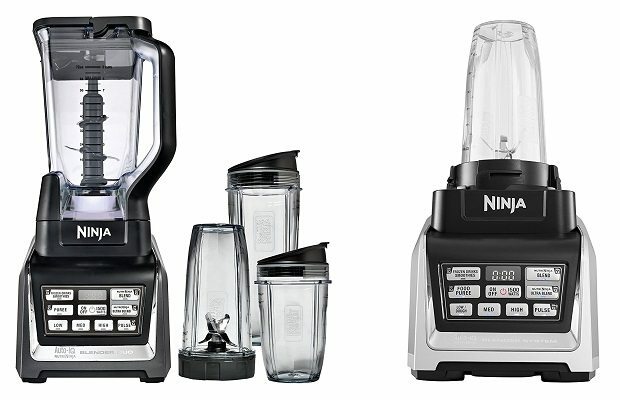 The Ninja Mega Kitchen System however, is more affordable than a refurbished Blendtec or Vitamix blender, and looking at its features and positive reviews, this model looks like a good alternative if your budget is a bit smaller. This machine is equipped with the so-called Total Crushing Technology, allowing you to pulverize and crush ice, fruits and vegetables in a matter of seconds. 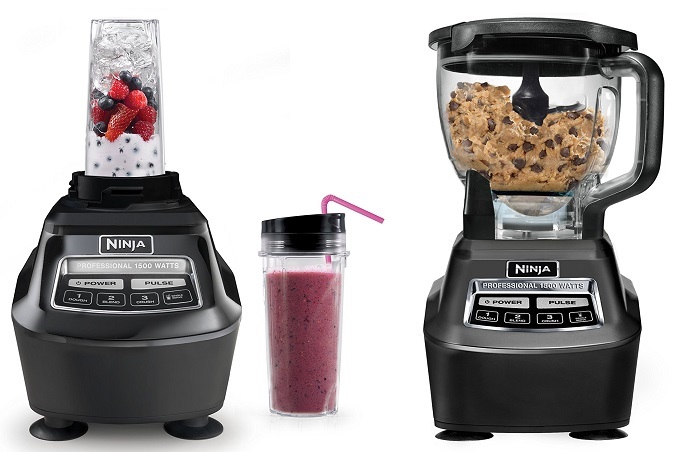 It doesn’t just do green smoothies, you can also use this Ninja model to prepare sauces, dips and other creamy liquids. The Ninja Mega Kitchen System includes a 72oz pitcher, an 8 cup processor bowl and a couple of handy 16oz Nutri Ninja Cups with lids. While the pitcher is for your delicious green smoothies, the huge processor is ready for all your chopping and dough making needs. Founded in 1947, Kenwood has established itself as a trusted manufacturer of quality kitchen equipment. Their latest blender model, the Blend-X Pro, uses Kenwood’s patented MultiZone blade technology that increases cutting efficiency by 30%. Have a look at the blades in the image above and see how the design consists of multiple layers of blades shaped in different angles. The 6 pre-programmed settings allow you to quickly blend your favorite drinks, smoothies and soups with no effort at all. After using a blender for a while, you will find that pre-set programs are actually very useful. You’ll be able to quickly work out which setting works best for what you’re trying to achieve and then it’s just a matter of pushing a button and wait for sixty seconds. Otherwise, the variable speed control setting is perfect if you want to be in full control and fine tune your blends the way you want them to be. Unlike most blender manufacturers, Kenwood uses glass material for the container. It’s a ThermoResist glass container that can easily handle any temperature without risk of cracking or shattering. While glass certainly has its benefits, I personally prefer plastic jars as they’re lighter and they won’t break when you drop them. This model in Hamilton Beach Professional series is the most affordable blender in this list of 10 best blenders for green smoothies, and is an excellent machine for those just starting out with blending. The financial investment is relatively small for this simple yet reliable and powerful blender. The Hamilton Beach Professional series has three models, two with a 2.4HP / 1800 watt motor and this particular one with a 2HP / 1500 watt motor. The price difference is quite significant and the 1500 watt motor does an excellent enough job. This model blender is the only blender in this list that has a removable sound enclosure that you can place on top of the container while operating. Pretty cool, and together with the rubber-mounted components, the noise is nicely dampened while blending. The shield can in fact also be used as a extra serving pitcher. With a simple twist button, you can choose between four pre-programmed settings to eliminate guesswork: smoothie, ice crush, puree and clean. The cleaning option is awesome as it makes cleaning the container a breeze, just like with the Vitamix containers. You can simply let the blender do its job, and it will stop automatically at the end of the program. The variable speed dial gives you full control during the blending process, and the pulse function can be used to achieve the ideal texture when mixing and chopping. The main drawback of this blender is the smaller 32oz container. A larger 64oz jar is definitely very useful because it allows you to prepare big batches of green goodness in one go. But at this price setting, a smaller container is perfectly acceptable. It also includes a handy tamper to push ingredients further down into the jar if things get clogged up, which can happen with any blender. Did You Find Your Favorite Blender for Smoothies? Are you ready to take the plunge and make green smoothies an important part of your lifestyle like I did a few years ago? The above blenders are certainly not cheap but they are a great investment for your health. They are designed and built to last and are able to prepare the best green smoothies for you and your family. Blending has changed my life for the better and I can’t imagine going back to where I was before I started making green smoothies. Getting all these nutrients in on a regular basis has done wonders to my health. I feel more energized, my skin looks a lot better, and it has also boosted my confidence. Make a habit of blending and experience yourself how this can change your life in so many ways. Have a look at some of my green smoothie recipes to get started. My favorite recipe? Check out these green tea smoothie recipes, absolutely delicious and super healthy. The fun with blending is that you can keep experimenting with new ingredients and see what works and what doesn’t work for you. I often add turmeric, chia seeds and egg shells to my green smoothies, just to name a few exciting ingredients. If you have any questions about any of these blender models or about blending and green smoothies in general, please don’t hesitate to get in touch. I am very passionate about blending and love to connect with other green smoothie fanatics.